This is going to be a long post by my standards. In short, I was tricked into thinking my lens which was for sale on eBay was paid for by a PayPal transaction. Once I shipped the lens, the PayPal payment was reversed. Both eBay and PayPal blamed each other after hours of phone calls to them. I contacted the Police and they referred me to Action Fraud to first determine if it was a Police matter or not. How fraudulently stealing a lens worth about £1,000 might not be a police matter is beyond me, but I filled out the form and waited 5 months for a reply. The reply from Action Fraud stated that this was just an “single isolated incident with no links to other reports” and wont be escalated to the Police. If it wasn’t for insurance I’d be completely lost. eBay, PayPal and the Police wanted nothing to do with it. 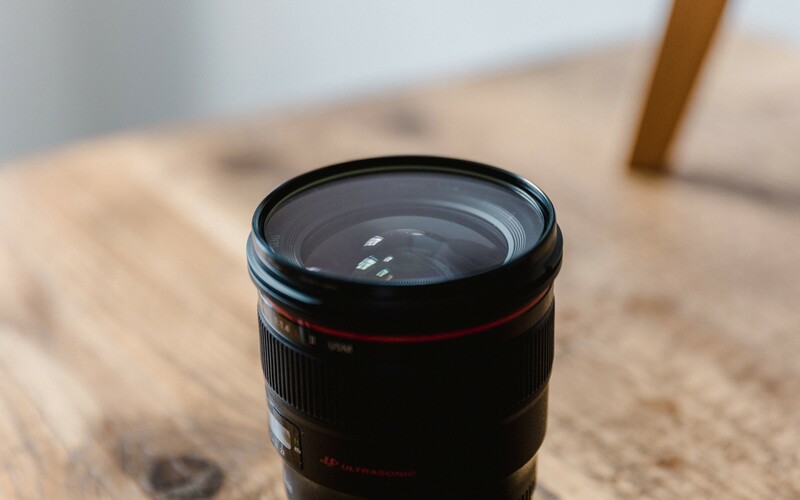 My lens sold on eBay on the 29th August 2017 for £991.01. The next day I received a PayPal notification for payment and the email stated it was time to ship the item. The email header from PayPal. I’m wary of scam emails, but this one looked fine. I logged into my PayPal account independently of the email and indeed the funds were sitting in my PayPal account. So I shipped the lens via Royal Mail Special Delivery to an address in Roslyn Road in London. A few days later I received six emails from eBay. They were notifying me that bids were removed from my item due to a compromised eBay account. Bids on an item that was sold, paid for and shipped. One of six emails from eBay saying the bids were all removed from the sold Lens. This is where it starts to unravel. The funds that remained inside my PayPal account were now marked as “On Hold” and unavailable for withdrawal. When I noticed that my funds were marked as “On Hold” I called PayPal and explained the situation. They told to me that it was eBay I had to speak to since they raised the Hold as there was an open “Dispute” on the transaction. 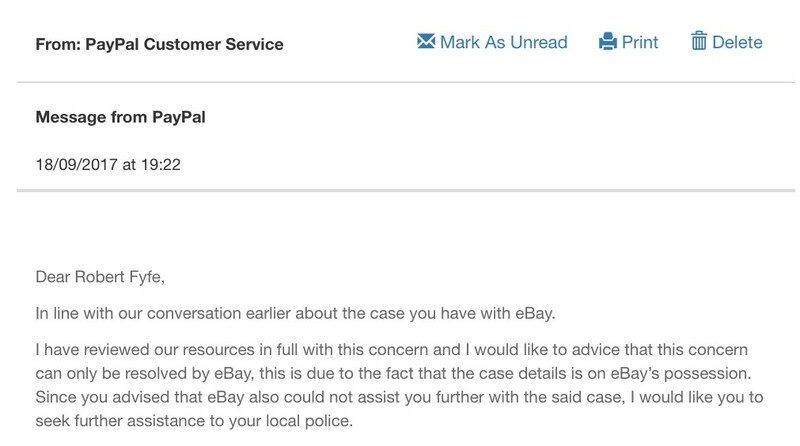 I called eBay and explained the situation, however they were unable to disclose the detail of the “Dispute” as the transaction was linked to an eBay account that wasn’t mine. Somehow I had the payment in my PayPal account for an item that had nothing to do with me—and it came through as a payment for a Lens of the same value as my own. I’d never heard of this other account, and it was never linked to my PayPal account. It’s this chain that locked me out of being able to do anything with eBay and PayPal’s support as it’s not linked to me on their system. It’d break confidentiality if they gave me details. Despite me reciting all the fine detail of the dates, descriptions, prices, usernames, they refused to say anything other than agree with what I could tell them. The only hope eBay gave was to bring this up with PayPal’s support. Who in turn said the same about eBay. And in turn said the same about PayPal. Stuck in a loop via hours of phone calls with no one to help. I moved onto PayPal’s secure support email system from inside PayPal’s website. Perhaps I could type out every detail better than I could explain to their colleagues on the phone. It turned out I was quite incorrect as they were unable to tell me anything other than completely misunderstanding the situation and then eventually completely ignoring me—failing to reply to any messages I’d send. One of the final emails PayPal sent me. I decided to give PayPal another call, since eBay continued to ignore me too. I escalated the call as high as I could go—to their escalations manager. He finally seemed to understand everything in full. He could see the “On Hold” status, and was able for the first time to recite the full story back to me. Previously other members of staff were only able to put together parts of it—or get so confused they’d hang up on me. He said it was a very complex case since it involved an additional eBay account which was used to lock me out of being able to contribute to the Disputes. It was this element that was the key to block me from fighting my corner of the Dispute. Something they “don’t see often” apparently. This gentleman assured me that the “On Hold” status would be removed from the pending payment and I would get the funds after all. I’d be covered by their Seller Protection Program. He even gave me his name and said I can call him back directly if he was wrong about it. On the 2nd October the funds were removed completely from my account. PayPal now completely ignore any communications with me. I’m unable to reach the escalations manager that said I could call back. eBay can’t understand it. My only hope now was the Police. I actually visited the Police station the day after all this kicked off. I had a statement ready, 20 pages of detail and screenshots. I even found the Facebook profiles of the names involved that I’d managed to find. One of them really liked photography. The Police told me that since this was internet fraud it must be raised with Action Fraud. The UK’s National Fraud and Cyber Crime Reporting Centre. I went onto their website and raised a case. It was quite a frustrating experience for two reasons. The first, the form you need to fill in is very restrictive. I had to cut out a lot of detail from my statement to get it to fit within their character limits. I was unable to attach any screenshots either. This worried me as I felt it was all the detail that’d convince them that this was worthy of Police attention. Secondly, I was informed it’d take up to 28 working days to let me know the outcome of my case. If it’d be worthy of being escalated to the Police to deal with. Who knows where the lens would be after that amount of time. I waited just over 90 working days, and I had heard nothing from Action Fraud. I contacted them for an update—to which their reply was I’d get an update on my update within 28 working days. Action Fraud is the UK’s national reporting centre for fraud and internet crime, and takes crime and information reports on behalf of the police and gives advice and fraud prevention guidance. Action Fraud does not have investigation powers, however, the reports taken by Action Fraud are sent to the National Fraud Intelligence Bureau (NFIB) which is run by the City of London Police, the national lead force for fraud. The NFIB collates and analyses intelligence on fraud, identifying viable lines of enquiry and developing packages for dissemination to a force for investigating. Your report has been sent by Action Fraud for assessment by the NFIB. The NFIB’s systems assess reports of fraud and internet crime from across the UK, helping to build a national picture of where fraud and internet crime is taking place. Experts review the data from these reports to decide whether there is enough information to send to a police force for investigation. Action Fraud have liaised with the NFIB who say unfortunately, your report has not been passed on to a police force for investigation at this time as this appears to be a single isolated incident with no links to other reports. Reports at the NFIB are assessed daily for viable leads and links to other criminality and the data you provided may still link to another crime. I regret that I cannot be of any further assistance at this time. It appears if you commit cyber crime once, it’s fine. The only thing that was painless about the whole process—which I believe has taken up about 30 hours of my time in emails and calls—was my insurance claim. I have insurance With Jack. They paid out almost immediately after I claimed. They understood the situation and frustrations I was going through. If it wasn’t for the insurance I had, I’d be down about £1,000 with no help coming from eBay, PayPal or the Police. I don’t have the energy beyond writing all this up to chase this further. I wont be selling anything of value on eBay again. I’ll be closing my PayPal account in the hope I never have to deal with them again. A designer and photographer from Stirling, Scotland.